Meet our team of moving professionals at Eastern Connection Movers. David has been with Eastern Connection Movers for 11 years and has time and time again proven to our customers that when you book your move with us you will get a absolute professional move . Dave strives to provide reliable and professional moving services to our customers by going above and beyond your expectations. Dave is also a licensed electrician and has helped our customers when they have us to move them to do any wiring of appliances and light fixtures that a customer might need to be done to complete the moving job. 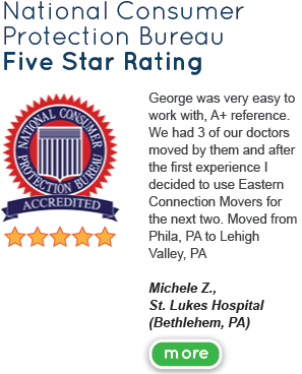 George has been with this company for well over 25 years and is an expert mover, learning everything there is to know from his Father, and founder of Eastern Connection Movers Steddon Strouse. George has proven time and time again to our customers that they have chosen the right company to move them. He takes great care when packing and moving all your valuable possessions: from moving of that antique furniture or the careful packing of our customers great grandmother's china and to the crating required for some expensive art work or to the moving of a customer's 1964 corvette fast back, he is the man for the move. George brings with him great customer service as well as a quality of caring that are difficult to find in any Philadelphia mover. You’ll be singing the praises of the entire team once you’ve had the chance to work with George and the rest of the crew. Mike has been with Eastern Connection Movers for over twelve years and is a well seasoned moving professional. Mike believes that Philadelphia moving company, Eastern Connection Moving is your total moving connection. He expresses that by giving each of our customers the absolute best moving, packing and storage experience. Mike has an eye for customer satisfaction and he runs as one of our road drivers whether your move is a local or out of state move. Ben G. Comes from a moving and storage background and has joined Eastern Connection Movers Team. Ben ins an invaluable resource because of his other trades, such as electrician and plumber. His advantage with these other skills will allow us to give you our customer a much better reason to choose us to move you. He can hang any electrical fixture you would need to make your move in a better experience.